Is there a book you read as a child that changed your life forever? It's one of those public radio questions calculated to make you feel like a clod — as if you were reading literature for inspiration instead of homework. But now that I have out my pens and bristol board for a cartooning class, I realize that there was a book that changed my life. In sixth grade — 1960 — I won an Honorable Mention in a poster contest sponsored by AAA and the St. Louis Christmas Carol Association. I had fun painting my goony carolers but labored endlessly over painting the required block letters. I must have communicated the lettering agony to my Uncle Pat. Next thing I knew, he dropped off a book for me. Written on the first page in india ink was a note congratulating me on my achievement. My uncle (also my godfather and father to 6 kids of his own) worked as a draftsman. The small paperback was "The Speedball Book of Lettering." The idea with Speedball is that you buy their pen nibs, then use the book to guide you in the proper shape of letters. I didn't really put two and two together about the nibs. I had a pencil. I started copying letters. The book went everywhere with me. I analyzed and reproduced curves and slants. I slowly began to see what made letters belong to one style versus another. Somewhere along the line Uncle Pat also gave me an Ames Lettering Guide, which quickly puts pencil rules on a page for precise line spacing. Lettering became my special skill. I was on a track in high school where I wasn't allowed to take art classes, but I still drew letters. My dad had me doing covers for the church sports banquet programs. And I drew giant 1960s-style balloon letters for high school drama productions. My grandfather Ewald asked me to do a "For Rent" sign. As I sat at the kitchen table slowly outlining the letters and filling them in, he watched with both fascination and impatience, giving me pointers about how I might increase my efficiency. In college I made brochures and posters for the Spanish Department. My willingness to letter anything was a source of great popularity — I was fast and fun (with a magic marker, that is). I carried the book around with me till my job at Green Valley School — 11 years or so. By that time it was stuffed with my "portfolio" of program covers and brochures, all held together with a rubber band. Then it was gone. I searched high and low, desperate to find it. It was like losing my best friend. Gone. Just gone. But the letter-mania stuck with me. Back in those pre-Letraset, pre-computer days, everyone loved a sign painter. Or someone to letter their favorite poem. Around 1978 I actually took a calligraphy course and figured out the Speedball nibs. "Drawing" letters was frowned upon in the calligraphic world of pens and brushes, but it was still my first love. My drawing of letters on roller skates caught the attention of Pat Drum in 1980. She got me to do brochures for her growing aerobic dance business — and then figured that, if I could do letters, I could do any kind of graphics. That started a 10-year exploration of more skills and was the beginning of a beautiful friendship. Gosh. A book. A book that guided me on the path of art, craft, usefulness, popularity, pure enjoyment and friendship. And here I am today with my old pens spread out in front of me once again, having a ball. 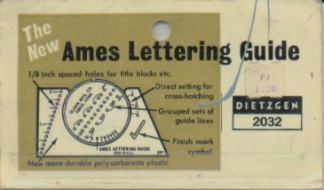 My original Ames Lettering Guide, with the $1 price sticker on its plastic sleeve, still works like a charm. I'm a little out of practice doing hand-lettering, but it's flooding my heart with memories of my old "Speedball Book of Lettering" days. Today: Of course, it wasn't the book that changed my life. It was the uncle who had faith in a child, faith that she might share an interest of his and go on to develop it. Wasn't that his gift? Having faith in a child is the gift that ripples through a lifetime. Thank you, Uncle Pat (1931-2013). 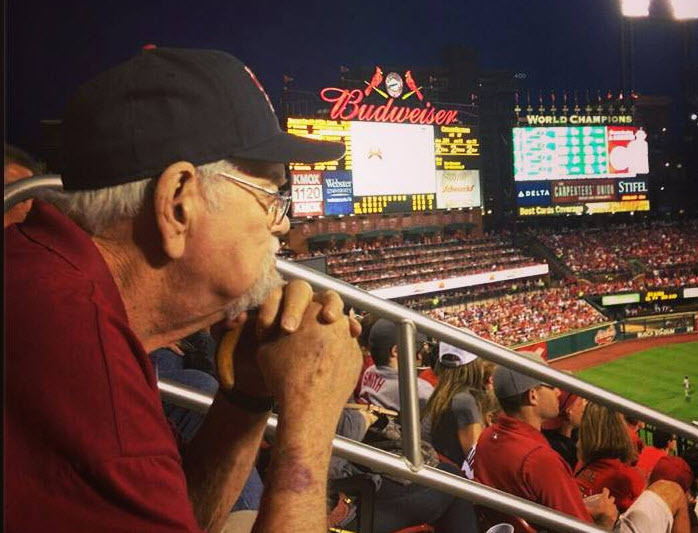 Photo lifted from the Facebook page of my cousin/his daughter Amy, taken at a recent Cardinals' game. Photo by his granddaughter Bridget Jeep.